BrokeHorrorFan.com presents Terrifier and Book of Monsters on limited edition, fully functional VHS! The latest contemporary horror films to join the retro VHS line are on sale now at WitterEntertainment.com. 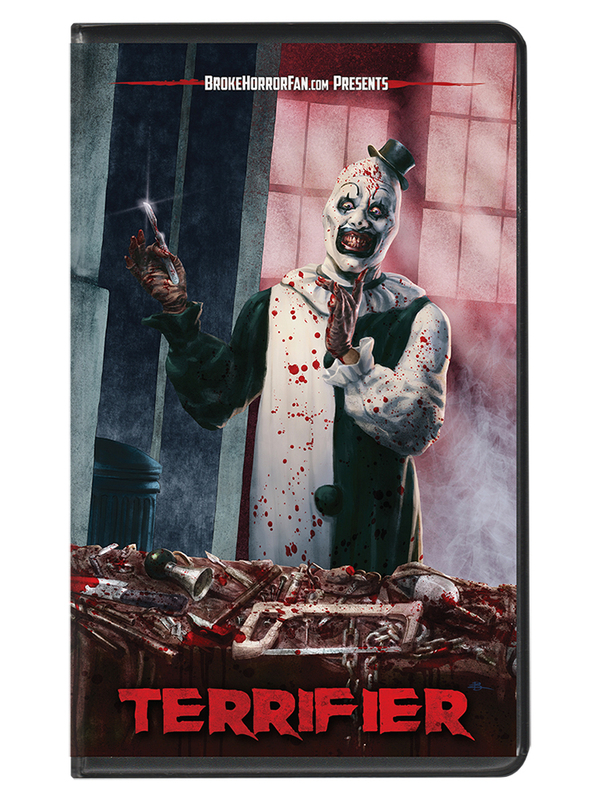 Terrifier has two all-new VHS covers in black clamshell cases: the standard edition featuring art by Vasilis Zikos, with a first pressing of 150, and a variant featuring art by Steve McGinnis (Fangoria), limited to 50. The 2016 slasher cult classic includes a letter from writer-director Damien Leone and an exclusive introduction by Art the Clown actor David Howard Thornton. Plus stay tuned after the movie for two special features: behind-the-scenes footage and Art the Clown makeup time lapse. Book of Monsters is a one-time VHS pressing limited to 50 units in black clamshell cases. It features cover art by The Dude Designs (Hobo with a Shotgun, WolfCop). 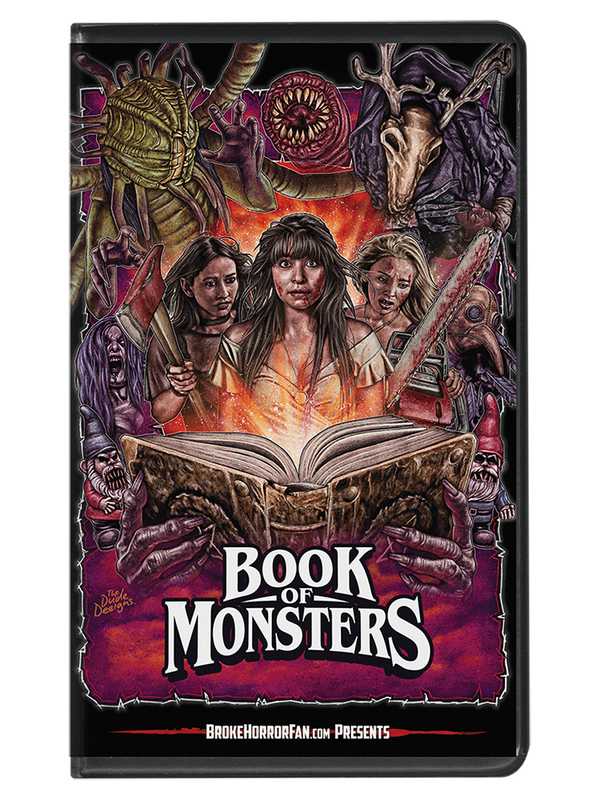 The 2018 monster movie includes a letter from director Stewart Sparke and exclusive introductions by actors Lyndsey Craine and Nicholas Vince (Hellraiser). Plus stay tuned after the movie for a special feature: the original crowdfunding short film. Both titles are officially licensed from Dread and Epic Pictures and have been approved by their respective directors. The films have been cropped from their original aspect ratio to 4:3 for optimal VHS presentation. Terrifier and Book of Monsters are available on VHS now from WitterEntertainment.com, where you can also purchase Victor Crowley, Dead by Midnight (11pm Central), and Dark Roast/Root of All Evil on VHS. Art The Clown returns and sets his sights on three young women, along with anyone else that gets in his way. Jenna Kanell, Samantha Scaffidi, Catherine Corcoran, Margaret Reed, and David Howard Thornton star in the film, which is written and directed by Damien Leone. Sophie’s 18th birthday becomes a bloodbath when monsters descend upon her house and start to devour the party guests. Lyndsey Craine, Michaela Longden, Lizzie Stanton, Rose Muirhead, and Nicholas Vince star in the film, which is directed by Stewart Sparke and written by Paul Butler.